Part II is here and Part III is here. I’ve recently read some implausible claims from the LibreOffice project, concerning their stats for downloads and users. (These two different statistics are unfortunately conflated in their publicity campaigns, but more about that later). Their claims fall apart if given any scrutiny and placed against comparable numbers from Apache OpenOffice. I think you’ll agree by the time you are done reading my analysis . If this were merely yet another case of puffery from the LibreOffice marketing department then I might just let it go, as I have with many other similar claims in the past couple of years. But to the extent that some people seem take these claims as facts, and are repeating, them, then I hope I will be forgiven for giving truth a chance to be heard. I’ll lay out the numbers as I know them and let you be the judge. First, what do we have on the Apache OpenOffice side? Most of our downloads are from our download site hosted by SourceForge. The download stats are public and exposed by SourceForge via their REST API. We gather these stats with a Python script (also public here) and that data is saved to a data file, which is then plotted on our website. So everything is open and transparent here. The downloads are counted by a respected 3rd party and the entire processing of these numbers is open for inspection. It is all there, day-to-day, including breakdown by country and operating system. We have nothing to hide. The LibreOffice numbers, on the other hand, we only know from download claims in press releases, and then only at long intervals. We have no idea what exactly they are counting. They have never made the detailed stats public. This does not mean that the numbers are incorrect of course. It just means that no one outside of their project’s leadership is able to verify the claims. But taken for what its worth, let’s look the recent LibreOffice claims and compare it to the actual data posted by Apache. On Sept 27th, LibreOffice claimed “Downloads since January 25, 2011, the date of the first stable release, have just exceeded 18 million”. So both projects are doing equally well, yes? Well, no, not at all. You need to take the time interval into consideration. The LibreOffice counts were from January, 2011. The OpenOffice counts were from May, 2012. So in just a few months OpenOffice was downloaded as many times as LibreOffice was in its first two years. 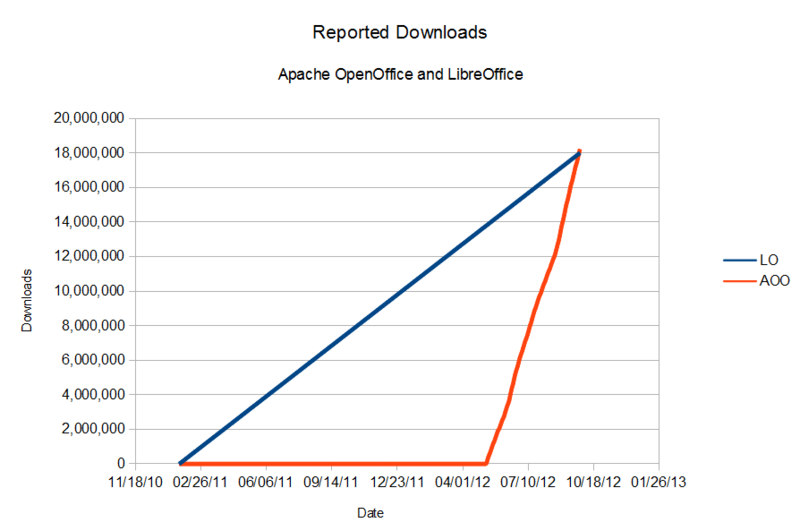 So the download rate has been 4x greater for Apache OpenOffice, and shows no sign of slowing. It is important when looking at download numbers that one does not equate download counts with user counts. This is especially true when you are dealing with upgrade cycles. As you probably know, neither OpenOffice nor LibreOffice have an incremental update facility. If you want to update, say from Apache OpenOffice 3.4.0 to 3.4.1 then you need to download a complete copy of 3.4.1 and install it over your 3.4.0. This complicates things. Upgrades tend to inflate the download counts, since an upgraded user is counted twice: once for their original download and a second time for their upgrade. This makes estimating the number of users from the number of downloads tricky. So to be fair, when estimating the number of Apache OpenOffice users we must not neglect the impact of having a minor maintenance release on causing two downloads for users who upgraded. But if this is an impact on OpenOffice, which had only two releases to reach 18,207,610 downloads, then how much greater must be the impact for LibreOffice? For example, their 3.5.x series had 7 releases to fix critical bugs. Their download counts included downloads from 3.3.x, 3.4.x and 3.6.x series as well, each one with its own set of bug fix releases. One must assume, due to the long duration of this reporting interval (nearly two years) and the instability of the early releases within each series, that LibreOffice users have upgraded numerous times each, causing numerous duplicate download counts, and leading the aggregate download count to reflect several times the number of actual users. In other words, having a rapid release cycle with no incremental update facility will juice your download numbers since each real user will end up downloading many copies of your product. Since LibreOffice had a dozen or more releases, and OpenOffice only two, it is logical to conclude that the LibreOffice user numbers are far less than suggested by their download numbers, perhaps lower by a factor of 4 or 5. I anticipate several objections against the above analysis, so let’s treat those one by one. First, one might note that LibreOffice has claimed an additional two million downloads from “external sites offering the same package”. Since these claims are not backed with names or numbers, I cannot say much other than the fact that OpenOffice is downloaded from external websites as well. But we don’t count those in our main download counts. But suppose we wanted to, and wanted to do apples-to- apples comparison with LibreOffice, with numbers from a 3rd party neutral source? In this case the OpenOffice download numbers are greater by a factor of 18x. So I don’t think the external download sites changes things much. The numbers are small overall, but per day the OpenOffice numbers are far higher than LibreOffice’s. Conveniently ignore AbiWord, KOffice, Gnumeric, Calligra, Google Docs or even MS Office under Wine, and assume that everyone on Linux uses LibreOffice. Ignore the many Linux users who are displeased with LibreOffice and who have uninstalled it and replaced it with OpenOffice instead. They make these assumptions and then claim another 30 million LibreOffice users on top of their inflated claim of 20 million Windows/Mac users. But this really misses the point. The trajectory is what matters. In a long race you bet on the faster horse, not the one who has a small head start. You can have 100% of the 3% Linux desktop market and even under the rosiest assumptions that is only 3%. And that number is decreasing, as desktop users move to tablets, where Android is the player and the Apache License is preferred for userspace code. And I doubt Google will prefer LibreOffice in this space over their own recent QuickOffice acquisition, which already has an app supporting Android (and iOS). Another point is that one should not equate users who intentionally download and install a product with users who have it automatically installed as part of an OS, without their knowledge. These are not the same thing, and to treat them as such is to confuse a downhill skier with someone who fell down a snowy hill. The one does something intentionally; the other has something done to them. That is not to say that Linux users are not important. We certainly treat Linux as a first-class platform within the project. I’d like to see us do the packaging work necessary to make Apache OpenOffice available to users on Linux, via their distros. Users should have choice, even on Linux. If you’re interested in helping with this, send me an email. Another objection is to say that all projects live in a different context, with a different user base and that the numbers can never be compared against each other in a fair way. All is relative, subjective, and LibreOffice is justified in making any claim it feels like, since it is its own reference and base of comparison. There are several counters to this objection. First, when LibreOffice publishes numbers, in press releases and blog posts, it has an obligation not to deceive its readers. This is basic professional ethics. When you claim a certain number of users, there should be some solid basis for making that claim, not merely the absence of contradictory information. In any case, I’ve provided adequate contradictory data in this post. Another counter is to point out that some comparisons are closest to an apples-to-apples comparison. For example, the number of Windows downloads directly from a project’s website. OOr downloads from a neutral 3rd party website like CNet’s Download.com. Of course we can debate the fine details and nuances to the right of the decimal place. But that does not provide an excuse for conflating download numbers with user numbers in a press release. You may not know everything, but you should know that this is not right. Apache OpenOffice makes available detailed download statistics in near-realtime for inspection. LibreOffice makes download claims in press releases at wide intervals with no supporting data. Under a series of implausible assumptions, LibreOffice claims an additional 30 million users on Linux. The actual number is unknown, but likely far less. But since Linux desktops are only 3% of the desktop market, and that market is shrinking, this is not a realistic growth opportunity for LibreOffice. We have never compared our download numbers to Apache OO download numbers, so your post is a clear (and unfortunately repeated, not only from you but from many Apache OO supporters) attempt to spread FUD on our project. Should I write a similar post commenting your questionable committer’s numbers? Apache OO at Ohloh includes commits not only to the software code, but also to the website and the wiki (something which is easy to spot by looking at the 20% HTML percentage on Apache OO code base, which is published on Apache OO home page at Ohloh). Unfortunately, your posts and comments, together with those of your fellows at Apache OO, confirm something which was unfortunately not necessary to confirm: Apache OO has been created to kill TDF and LibreOffice, with the unfortunate complicity of Apache Foundation. So far, I have refrained from publishing the anthology of FUD spread by you and your friends, because I feel that it is just useless for the end users, and especially for those who are migrating from OOo to LibreOffice, like the City of Munich. it is just impossible to have an adult attitude while you are progressing in your strategy of direct attack. it is impossible to refrain from attempting to set the truth straight. @Italo, I hope that through your sputtering anger you see that I am laying out some basic facts and logic and that facts and logic are not dependent on your personal feelings towards me. I’m not asking anyone to take my word for anything. I’m just pointing to the publicly-available data and inviting anyone to contradict or confirm the facts as I’ve described them. This is the opposite of FUD. Remember, I have a significant record of bringing real data to bear on outrageous claims. This was true of Microsoft’s claims. It was true of Ecma’s claims. LibreOffice is not immune from a reality check now and then. But I can tell you that diverting with a personal attack is never a good way to handle this, since it makes it look like you have no response counter to this post. Eighteen million downloads based on hard work and positive press versus eighteen million downloads for having been given someone else’s trademark. Apache OpenOffice: success through nepotism, the true Mitt Romney of office suites. Sad to see the fight between LO & OOo, 2 programs I have benefited so much from & still do. I hope this needless fight is resolved soon. I am sure monopolist must be licking its chops in glee! I hope both LO & OOo do well. The fact that LO & OOo gifts excellent & empowering software for free makes me very happy. Every single download/ installation whether it is LO or OOo should be celebrated because of the service it does to people all over the world. Since Ubuntu has LibreOffice on the CD; why anyone needs to download it from TDP site? When I install Xubuntu for some older machines I install LibreOffice but it is automatically downloaded from Ubuntu repositories. @Stephen, the projects actually do collaborate in the areas that you describe, from a common user support forum, to collaboration on standards, to a common discussion list for security-related issues. So I think there is an ample amount of good will on both sides, among the rank-and-file members. Unfortunately the leadership of the LibreOffice project has rebuffed attempts at furthering collaboration. For example, a joint dev room at FOSDEM was proposed, by the organizers, for OpenOffice and LibreOffice. We were happy to do this. LibreOffice refused. @Paul, I hope you see that wanting to have an accurate, unbiased, reviewable set of download numbers is not antagonistic to any project that is making legitimate claims. Asking for accuracy should not be seen as a “fight”. @Chris, and LibreOffice took code that someone else (primarily Sun and StarDivision employees) wrote. No one here is working with something that they wrote from scratch. Everyone is benefiting from else’s work. LibreOffice, for example, benefits also from their connections with Linux package maintainers, allowing them to exploit that trust to silently replace OpenOffice.org with LibreOffice without user assent. @Mahmut , I covered that concern in the section called “Objection: Linux Users”. Sorry Rob, reading about your position at: http://www.robweir.com/blog/who-is-rob-weir, I cannot bielieve you are unbiased about this topic. LibreOffice has won OpenOffice long time ago. I would really love to have the choice between LibreOffice and Apache OpenOffice on Ubuntu! @Neticis, Of course I have a point of view and a bias. Do you think the LibreOffice marketing department does not? But the data remains, and facts are facts. I’ve given you the data and analysis and you can come to your own conclusion. @Matthias, thanks, I would like that as well. @Rob : as usual, provocative and thought provoking, and not necessarily without bias, but you do have a point. It would be nice, as a purely social or statistical exercise, to be able to do a similar sort of comparison with LibreOffice download data. I have no interest in marketing fud, at least where software is concerned, it is whether the software does what I need that is important. – LO because of its reliance on a single volunteer to maintain the whole of the database code in his spare time who, in no small part due to what I perceive (perhaps erroneously) as a lack of cohesive strategic direction in feature development of the other modules, and their impact on the DB module, has to spend his time trying to patch up the new errors introduced by other developers’ feature commits for the other modules – the incessant resulting instability of subsequent major version LO releases is a big negative for business case usage. In an ideal world, both projects would work together to maintain a cohesive strategy on code development, however, given the current stances and posturing, that seems unlikely. The end result, absent the rift itself, will be to play into the hands of the competition, be it Google, various cloud offerings, or Microsoft. Why, as a decider, get bogged down in polemics and in-fighting when one can choose a product which just works (mostly) the way the user wants it, and also reads ODF ? @Alex, good points, as usual. Getting the projects to work together and ending the fork is relatively simple. I think it could be done in 30 days or less if the LibreOffice volunteers really wanted it. But I’m not sure they do. Who really cares about the download numbers? The real question each user needs to ask is which product works better for me? I can tell you both numbers are highly exaggerated. Each time in my house someone other than me goes to download, they first download open office, then they realize that is not what they wanted and ask me again what is the name of the product they should have downloaded. Both are good products. My only reason for preferring LibreOffice, is there seems to be more active development on that project, and I notice the improvements. @Bill, We also hear of many users downloading and installing LibreOffice and then going back to OpenOffice once they experience quality issues in LibreOffice. But I have not heard a credible argument that this is anything other than a 2nd order effect on download or user counts. you know, a client may consider to use OpenOffice but then you find out that they use “subversion” at ApacheOO. Of course you can’t sell that to the French army. They require government information technology, in short git, not subversion. And then we have the advantage that LibreOffice is actually French, so we don’t need to find a suitable French name. We noticed that Apache held the project in-cuba-tion and discovered that Apache means enemy, not to mention the Apache Geronimo, a code name for Mr. Bin Laden. While the French army staff was very positive to use MsOffice with Wine, they found out that you could also use Libreoffice with Wine. Ultimately these high potentials took Office 2000, a good year for Wine. Most Linux users can’t affirm the assert that their desktops shrinks. Must be an issue with your graphics chip driver. One of the benefits of GNU/Linux is choice, and the availabilty of decent alternatives such as AbiWord and Gnumeric. Both OpenOffice and LibreOffice are overkill for most writers’ purposes: they seek to emulate MS Word rather than provide the simple functionality most writers/spreadsheet creators need. But given the ongoing desire to create a free software rival to Word, can you explain to me why the major GNU/Linux distros have opted for LibreOffice rather than OpenOffice? This useless argy-bargy in the end will harm both, Libreoffice and OpenOffice. You guys should unite and work on a better codebase, instead of downplaying each other!